There are patches against Meltdown for Linux ( KPTI (formerly KAISER)), Windows, and OS X. There is also work to harden software against future exploitation of Spectre, respectively to patch software after exploitation through Spectre . Written by Michael Larabel in Linux Kernel on 3 January 2018 at 12:45 PM EST. Update: Linus Torvalds has now ended up pulling the latest PTI fixes that also include the change to disable page table isolation for now on all AMD CPUs. The commit is in mainline for Linux 4.15 along with a few basic fixes and ensuring PAGE_TABLE_ISOLATION is enabled by default. Kernel developer Thomas Gleixner wrote in the pull request of disabling KPTI on AMD hardware, "Not necessarily a fix, but if AMD is so confident that they are not affected, then we should not burden users with the overhead." instructions past illegal memory accesses are also performed. causes access to unmapped kernel memory resulting in double faults. using a different mechanism for declaration and definition. but it slipped through the cracks. burden users with the overhead"
Meltdown: Confirmed on Intel CPUs. Believed AMD and ARM CPUs unaffected, or at the very least not affected in the same way. OS level fixes are being implemented. Specter: Affects all Intel, AMD, and ARM CPUs. There is no current solution that works across the board. Basically: Every consumer level CPU released since the mid to late 90's have had gaping security holes. One of them appears Intel specific and is being fixed, the other affects everyone and is not. Meltdown I believe you are correct. I believe they are using software to help mitigate Spectre, but there is no fix for any X86 platform. It's just as important to make sure you stay up-to-date. While Spectre may not have an easy fix, Google says that there are ways to guard against related exploits. Expect Microsoft, Apple, and Google to issue a series of updates to their operating systems as new Spectre-related attacks are discovered. Additionally, because Meltdown and Spectre require malicious code to already be running on your system, let this be a reminder to practice good online safety behaviors. Don't download any software from a source you don't explicitly trust. And don't click on any links or files claiming you won $10 million in a contest you never entered. For Spectre, they're basically patching each individual application as problems are found, which essentially means "yeah, there's not much we can do as far as prevention goes". This week, news of massive security vulnerabilities afflicting every modern model of Intel processor went public, even as developers for practically every major platform frantically rushed to roll out fixes. 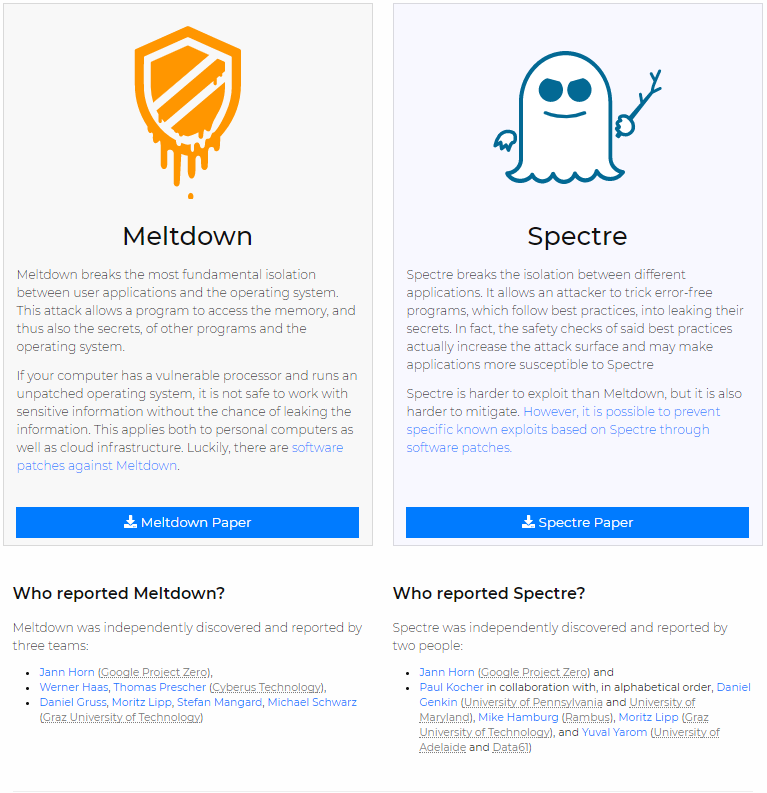 Much more information has now become available about Meltdown and Spectre, a group of attack methods malicious parties could use to break into some of the most sensitive inner workings of any device using the affected CPUs. In 2017, Google’s Project Zero team in collaboration with researchers at a number of different universities identified an absolutely massive problem with speculative execution, one of the techniques employed in modern microprocessors as a way of improving performance. Essentially, when a processor uses speculative execution, instead of performing tasks strictly sequentially, it predicts which calculations it might need to do subsequently. It then solves them in advance and in parallel fashion. The result is that the CPU wastes some cycles performing unnecessary calculations, but performs chains of commands much faster than if it waited to process them one after the other. However, there’s a serious flaw in the way modern processors are hardcoded to use speculative execution—they don’t check permissions correctly and leak information about speculative commands that don’t end up being run. Whoops. As a result, user programs can possibly steal glimpses at protected parts of the kernel memory. That’s memory dedicated to the most essential core components of an operating system and their interactions with system hardware, and it’s supposed to be isolated from user processes at all times to prevent such glimpses from happening. Everything from passwords to stored files could be compromised as a result. Spectre breaks the isolation between different applications. It allows an attacker to trick error-free programs, which follow best practices, into leaking their secrets. In fact, the safety checks of said best practices actually increase the attack surface and may make applications more susceptible to Spectre. There’s no way to truly fix Meltdown or Spectre on the hardware level. It can’t be fixed with a microcode update. Since this is a hardware bug, everything running on affected processors is vulnerable including every major OS (Windows, Linux, and macOS), some mobile devices, and cloud computing providers. Originally, the Register reported, only Intel processors (which dominate the U.S. market) were believed to be subject to the flaw. But it’s become clear that a wide range of processor types could be affected, with Google writing that AMD, ARM, and other devices were also vulnerable—though only partially and with less performance impact following a fix than Intel-based devices. What are companies doing about it? Companies are rushing to patch platforms. Per Axios, Microsoft has already patched Windows 10 and will release patches for Windows 7 and 8, Amazon Elastic Compute Cloud is already mostly secured, AMD is still investigating, and ARM is still working on how to address the issue. Apple did not respond to Axios’ request for comment, though security researcher Alex Ionescu tweeted it already released an initial fix for its desktop-based macOS in December 2017's 10.13.2. Well, yes, but it looks like it's not easy to do, and your system has to first be infected by malware. Only download trusted software can probably help mitigate chances of malware infection. Everyone should run script blocking extensions, and malware detection/prevention programs. Also, keep an eye out for new security patches that we should see rolling out across many different platforms with the IOT's this could be expansive, or on the other hand just leaving a bunch of gaps open for entry! 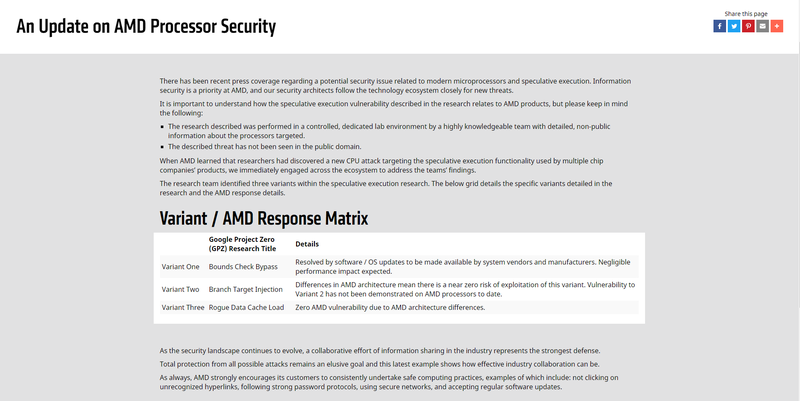 Owners of AMD and ARM systems shouldn't rest easy, though, and that's thanks to Spectre. Spectre is a more general attack, based on a wider range of speculative execution features. The paper describes using speculation around, for example, array bounds checks and branches instructions to leak information, with proof-of-concept attacks being successful on AMD, ARM, and Intel systems. Spectre attacks can be used both to leak information from the kernel to user programs, but also from virtualization hypervisors to guest systems. Moreover, Spectre doesn't offer any straightforward solution. Speculation is essential to high performance processors, and while there may be limited ways to block certain certain kinds of speculative execution, general techniques that will defend against any information leakage due to speculative execution aren't known. Sensitive pieces of code could be amended to include "serializing instructions"—instructions that force the processor to wait for all outstanding memory reads and writes to finish (and hence prevent any speculation based on those reads and writes)—that prevent most kinds of speculation from occurring. ARM has introduced just such an instruction in response to Spectre, and x86 processors from Intel and AMD already have several. But these instructions would have to be very carefully placed, with no easy way of identifying the correct placement. In the immediate term, it looks like most systems will shortly have patches for Meltdown. At least for Linux and Windows, these patches allow end-users to opt out if they would prefer. The most vulnerable users are probably cloud service providers; Meltdown and Spectre can both in principle be used to further attacks against hypervisors, making it easier for malicious user to break out of their virtual machines. Longer term, we'd expect a future Intel architecture to offer some kind of a fix, either by avoiding speculation around this kind of problematic memory access, or making the memory access permission checks faster so that this time interval between reading kernel memory, and checking that the process has permission to read kernel memory, is eliminated. to protected mode is made. sors that do not implement parallel instruction execution. control register, with the exception of MOV CR83), MOV (to debug register), WBINVD, and WRMSR4. •Non-privileged serializing instructions — CPUID, IRET, and RSM. At this point in time we have no idea on what is going on we must wait and see rumors and speculation mean nothing facts is the only thing i'm interested in. So far it seems that in part Amd processors are affected but not nearly as much as Intel and Arm is also affected. Amd claims this does not affect their CPU's Lisa Su herself said it so lets wait and see. I'll leave it to you randomizer. I'm going to bed. I was thinking about it. We do have an imperial ton of stickies already, but this is fairly important, so it probably warrants a sticky, if only temporarily. Good as stated before it was only a matter of time they just had to fix the issue as fast as possible exceptions was always going to be made. It's been around for a while now, so I can see why he would be "frustrated." Edit: Don't forget to update your OS! He is frustrated because Intel has done nothing but put out PR statements to deflect damage. So what does this mean for AMD users???? Benchmarking The Intel CPU Bug Fix, What Can Desktop Users Expect? Looks like 8700K benchamarks show that desktop users will not be affected by the recent patch. Only high I/O devices like NVME seem to be affected. AMD says their CPU's are not vulnerable! Edit: You just need to get your OS update! I posted a link with the information to manually download the Windows patch. Continue reading after the part that you bolded, concretely the part that says "our implementation might simply be too slow and a more optimized version might succeed." Currently, we have only verified Meltdown on Intel processors. At the moment, it is unclear whether ARM and AMD processors are also affected by Meltdown. The Spectre attacks affects virtually any modern CPU, not only those from AMD, ARM, or Intel. It seems a full solution of the problem will require a rethink of the design of modern CPUs. Question Meltdown and spectre, what CPU is safe? Should I do anything about Spectre and Meltdown? When will the I5 have a hardware fix for Meltdown/Spectre? Question Portrait Landscape Portrait triple; mixed rotation; 2019 amd nvidia status? [SOLVED] Really Old System I need help!